Valentine week is an excellent opportunity to express your love and gratitude towards your loved ones. 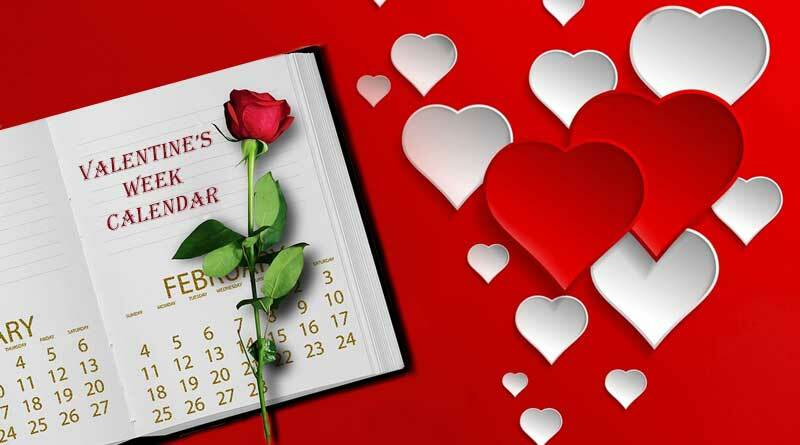 You can also surprise your loved ones or make them feel special with some innovative gifts and memorable gestures on all these seven special days of the Valentine week calendar. Beginning with Rose Day, Propose Day, Chocolate Day, Teddy Day, Promise Day, Kiss Day, Hug Day, followed by the Valentine’s Day. Let’s start from the first day, Rose day. This day marks the beginning of Valentine’s week. Nothing is more beautiful than a red rose or a bouquet of roses for your special one. Without spending much you can make your loved ones feel special by gifting a single beautiful red rose. Check out messages, WhatsApp Status and Rose Day images. If you are planning to confess your love to your crush, then it is the perfect day to break the ice. You can take your beloved for a date and confess your love like a pro. Make it so innovative and interesting that your lover is awestruck by your gesture and accepts your proposal in no time. Check out messages, WhatsApp Status and Propose Day images. You can also take a gift along that will always be a reminder of the special moment. Make sure to nurture your bond with love, care, and sweetness. There is rarely anyone who can say no to chocolates, gifts, and roses. Chocolate is just another way to keep the love going. So add sweetness to your love life by loading your lover with his/her favourite chocolate. Check out messages, WhatsApp Status and Chocolate Day images. What’s better than a fluffy, soft teddy bear toy to hold on … Almost all the women on earth love to have a teddy beside them. On this day gift your sweetheart a soft toy as a reminder and token of your love. So that when you are not around, they can hug the teddy and feel the warmth of your arms. Check out messages, WhatsApp Status and Teddy Day images. The next step is all about making promises and commitment. On this day you can mutually decide and make a promise to each other. It can be anything like going for the gym or workout sessions together at least twice a week or of travelling and exploring new places this year. Check out messages, WhatsApp Status and Promise Day images. Many kinds of research have proved that hugging helps us grow and maintain a stable emotional and mental health. So go and hug the people you love, express how much you value them and what they mean to you, because hugging is a beautiful gesture to say the unsaid. Check out messages, WhatsApp Status and Hug Day images. This day marks the special moments that loved ones share with each other, including spending time and kissing each other. Celebrate your day with a gentle, loving kiss on this day and experience the best of your love life. Check out messages, WhatsApp Status and Kiss Day images. So go and express all the love you have been holding back. We wish you good luck… because love is worth it. For more articles like ‘Valentine week calendar, do Subscribe to our newsletter and follow us on Facebook, Twitter and Google+.